Suggestions for using the video in the classroom are listed below the video. Further teaching ideas are on climatewisconsin.org website, which is quite comprehensive. 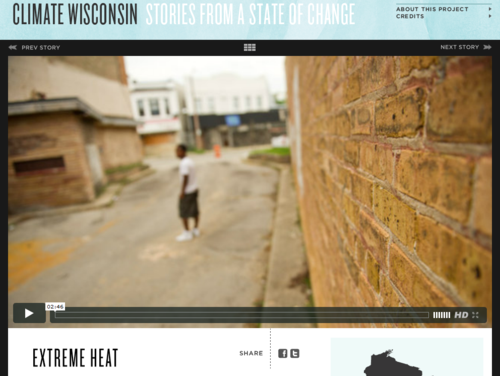 This video uses images, music, and poetry to describe the impacts of extreme heat on an urban community. Science facts are interjected into the narrative. An essay on the website provides additional background information. Urban environments can exacerbate the health effects of heat waves. Heat waves affect different population groups unevenly. Thus heat waves are a climate problem as well as a public health problem. Comments from expert scientist: Resource does well in highlighting geographical differences in extreme heat conditions. Statement that frequency of extreme heat events in urban areas is untrue. Extreme heat events are typically larger in spatial scale than cities (i.e. they are more regional than that), so frequency is largely determined by large-scale atmospheric/oceanic processes. This is a spoken-word media piece that mingles art and science in a way that successfully communicates important information in a compelling fashion. Students of color will likely be able to identify themselves with the main characters. There are some additional education resources as well as teaching tips available on the climatewisconsin.org website. The resolution may be be suitable for classroom projection.